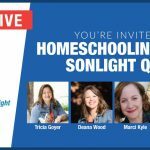 I read this article and wanted to share it with you: Homeschooling with Sonlight Q&A https://blog.sonlight.com/homeschooling-with-sonlight-q-a.html. 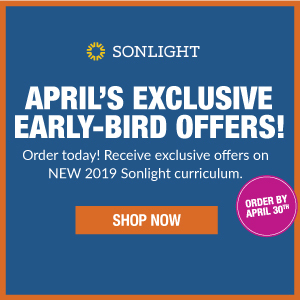 The Sonlight approach to homeschooling is unique, so it's natural for a newcomer to this curriculum to have a lot of questions. 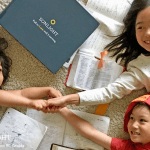 To paint a picture of homeschooling with Sonlight, here are seven common questions with answers—plus more to read if you want to dig even deeper. 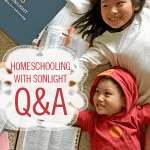 If your question isn't here, look at the bottom of the article for ways to get answers to anything that may be puzzling you about homeschooling with Sonlight. Q. 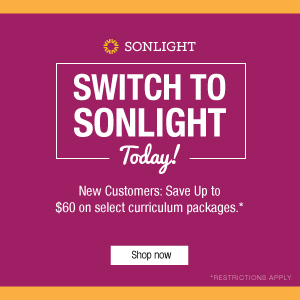 How much time does Sonlight take each day? A. In the early years, a solid Sonlight day is from 1.5-3 hours. As your child gets older, that will increase. High school students may spend around 6-8 hours a day, depending on how deeply they want to to tackle subjects. Q. How much time will I need to spend reading aloud each day? A. 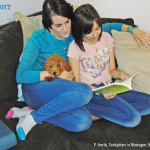 Families have all kinds of methods for tackling reading with Sonlight. I love to read aloud, so I usually read aloud as many books as I possibly can. Some days, I’ll spend about three hours all together reading aloud. Of course, keep in mind that I have four children spread across two History / Bible / Literature (HBL) levels. With only one HBL, you’ll need to read aloud much less. Many moms find that audio books checked out from the library are a lifesaver! 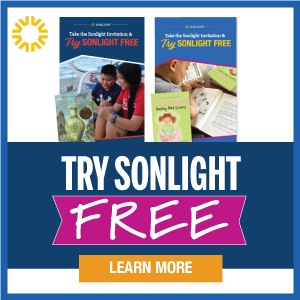 There are plenty of Sonlight books available on audio book at most local libraries. Some libraries also offer apps for audio files as well. I have found that as much as I love reading aloud, as my older kids have reached more challenging material, I’ve had to hand over some of the reading to them. I now find that hearing about books from them is equally enjoyable, and it gives me a new perspective on the literature seeing it through their eyes. Q. How can I have meaningful conversations with my older kids when I have littles afoot? A. Deep, meaningful conversations can be hard to come by when you are knee deep in the toddler years. I have realized that as children grow, particularly in adolescence, a whole new window of time opens up in the late evenings for great discussion. 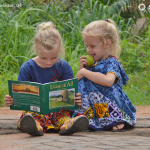 If you can’t block out a time during the day to be relatively uninterrupted, you might try including some book discussions in the bedtime routine. You may even begin to look forward to the evening ritual. 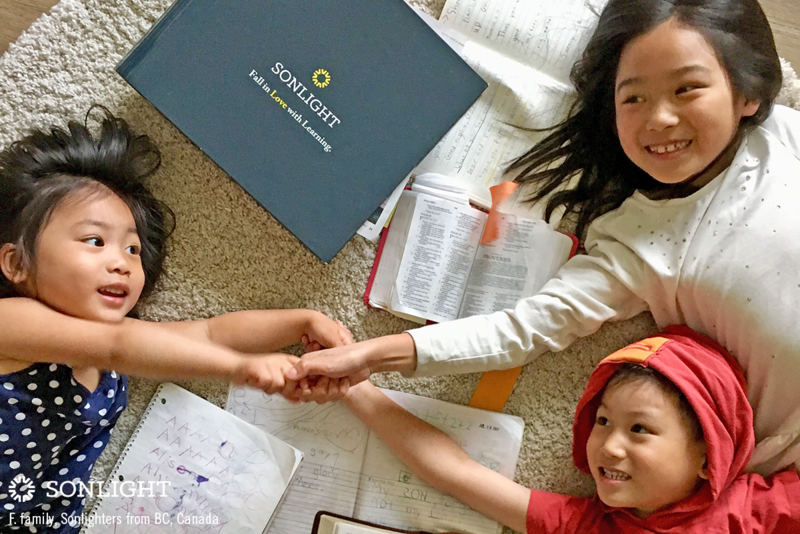 With Sonlight’s new four-day program, I can take one whole day each week to focus on my big kids. For example, this year, my older boys are working through their homeschool assignments mostly independently, and I’ll mark the items on the schedule that I’d like to do together or discuss. On Friday, our “day off,” we will get together and work through those activities, experiments, and discussions without the added stress of keeping younger children going on schoolwork. 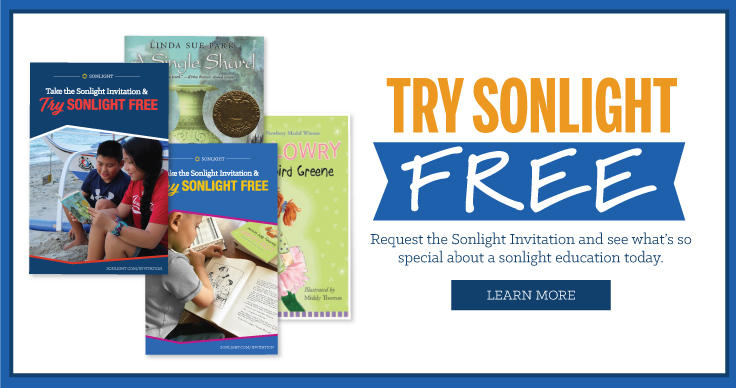 Take the Sonlight Invitation and see what's so special about a Sonlight education. Q. 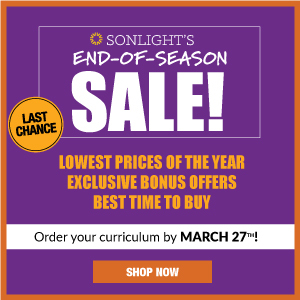 How do I tailor Sonlight to my children’s individual interests and learning styles? A. I have four children, and they all have their very own unique sets of interests and preferences for learning. Many times, figuring it all out is a process of trial and error. For example, my oldest son hates writing. When we first started Sonlight, I planned on his completing the Science worksheets each week. But, after the first week, I quickly realized it was not working. He was getting bogged down with the writing, and we weren’t getting anywhere with the science because of it. So, I began doing the worksheet orally with him each week. He loved science after that, and I enjoyed it much more as well. My daughter, on the other hand, thoroughly enjoys completing the science sheet each week, so I allow her to do just that. Homeschooling is about finding what works for your child. Some of my kids prefer to complete a project after or during a book reading. Some would much rather do a book report or a discussion. So I simply monitor and adjust as needed. Q. 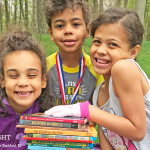 How do you keep from getting overwhelmed as your children get older and their books get longer? A. You hand over more independent reading assignments to your children, and you rely more and more on your Instructor’s Guide. It’s completely possible to hold an in-depth discussion on a book you haven’t read as long as you are armed with your Instructor’s Guide. It provides discussion starters as well as enough information to get a pretty good idea of what the book is about. Also, remember that it is okay to skip a book here and there. At the beginning of the year, I set a number of books, slightly less than the total, that I want my older kids to read from the HBL. If they need to skip a couple, it’s not a big deal because I’ve already planned for it. 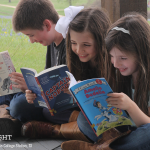 Keep the extra books for summer reading. Q. I’m either too rigid or too relaxed. How do I find a balance? A. There are two keys to a successful balance in homeschooling, setting expectations and consistency. At the beginning of the year, think through your expectations for them. Do you expect them to start their work on their own? Will they need to set their own pace or will you give them a list each day? Once you have set your expectations, consistently keep them. At some point or another in your homeschooling career, you will find that you have been either too rigid or too relaxed in one area or another. No need to worry. Simply decide what needs to change, possibly asking your child for input, and have a family meeting. At the family meeting, set the new expectations and be consistent in implementing them. As you go, you’ll eventually figure out the balance. Don’t be too hard on yourself. This process of finding balance teaches your children to adjust to situations and find balance in their own lives. Q. How do I keep up with grading when I have multiple children? A. Papers can pile up faster than the speed of light in a homeschool family with multiple children. My best tip is to keep a pen or highlighter with you at all times. As you work with your kids, give them immediate feedback on their work. This is especially important in the early years. You want to correct errors before they memorize the mistake. As they work or soon after they finish, glance over their paper and circle anything they need to look at. Have them immediately correct their mistake. They won’t learn from the mistake unless they correct it themselves. Staying on top of homeschool work becomes more challenging as your child gets older. For older students, I recommend going over their work at the end of each day. Sit down with your answer guide and your child, and go through the day's assignments. Mark anything they need to look at, and have them correct their mistakes as soon as possible. There are many laws concerning keeping homeschool grades across the states, so always check your local laws for what is required in terms of grading and record keeping. In my state, we aren’t required to keep any grades although I choose to record grades anyway. I do, however, simplify my grading. I only keep test grades in math. Daily work simply goes in the portfolio without recording it as part of the final grade. For reading, I keep a record of the books read and I’ll note the score on the comprehension questions in the Instructor’s Guide. I’ll also record the occasional book report or book project grade. For writing, I only record scores for the writing pieces, not the weekly language arts score. Once a paper has been graded or checked and corrected, it goes in a file for that child. At the end of the year, we will spend a day putting together our portfolios. Not recording every grade and not worrying about the portfolio every day prevents any feeling of being overwhelmed. If you've got additional unanswered questions, feel free to leave a comment here, reach out to an Advisor, or post in our Facebook community.